For a long time, Nikolai Medtner was best known for the fact that he lived the latter part of his life in relative obscurity in the UK. His piano music has subsequently been recognised for its importance, but his songs have remained relatively unknown. 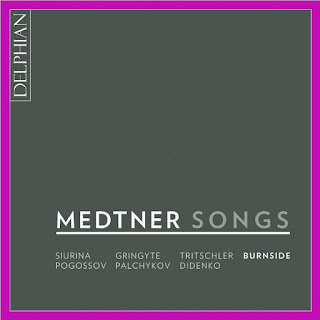 This new set from Delphian presents us with over 50 of Medtner's songs (around half of his output) with pianist Iain Burnside accompanying soprano Ekaterina Siurina, mezzo-soprano Justina Gringyte, tenors Oleksiy Palchykov and Robin Tritschler, baritone Rodion Pogossov and bass Nikolay Didenko. Born in 1880, Medtner was seven years younger than Rachmaninov and eight years younger than Scriabin. Like Rachmaninov, Medtner left Russia after the Revolution (though Medtner did not leave until 1921), but unlike Rachmaninov Medtner continued composition throughout his years of exile but the majority of his output seems to date from before the end of the 1920s. 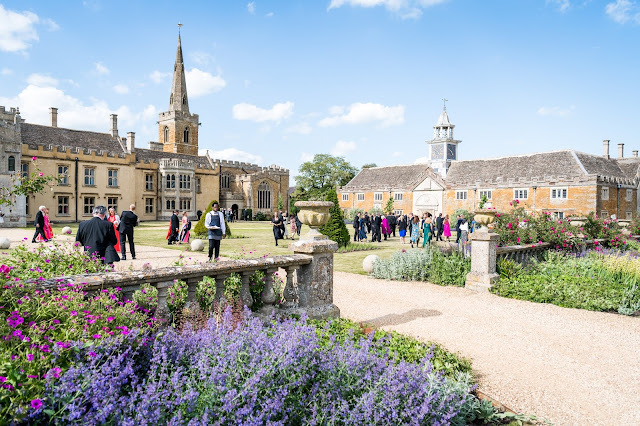 His style did not change radically and Francis Pott in his excellent article in the CD booklet suggests that this is partly because Medtner would store ideas in notebooks and return to them years or even decades later. 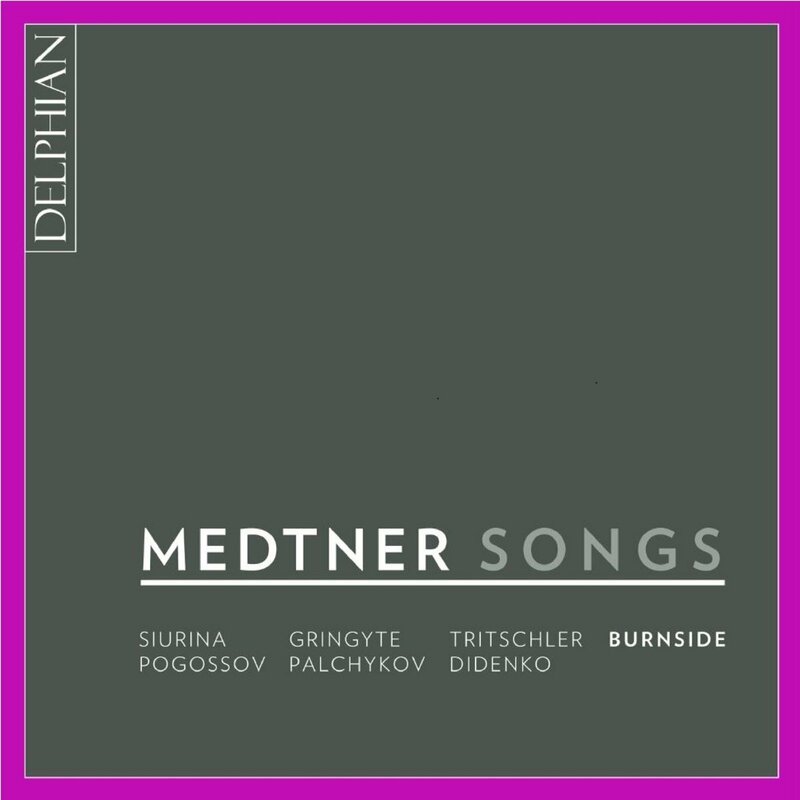 Medtner came from a background which mixed Russian and German culture, so that his song settings mix Russian poets with German poets set in German, though the latter date mainly from earlier in his compositional career. Whilst his approach to setting Russian and German can vary, Medtner's songs all have a very particular feel. Partly this is because the vocal lines are frequently syllabic, melisma and melody per se are less important than the expressive approach to the text. These are songs where the texts are important, but this is combined with a highly structural approach. Not surprisingly, given Medtner's complex piano music, the piano parts of these songs are challenging and substantial. The piano is always an equal partner and sometimes takes a dominant role. More importantly, Medtner's writing is highly structural and structured, the piano plays something far more than accompaniment and the vocal line takes its role in this structure. Often, the piano starts and gives us the basic ideas before the voice comes in. The songs lack the melodic appealingness of the best known Rachmaninov songs, but then again they also lack the gloopy sentimentality which one can sometimes associate with this composer. Another composer whose influence is sometimes suggested is that of Richard Strauss (16 years older than Medtner), and occasionally Medtner's approach to the music hints at the songs of the older composer. On this disc we are presented with a selection of the songs, spread right across Medtner's career from the Three Romances Op.3 to the Eight Songs Op.61. 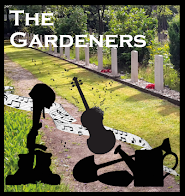 Iain Burnside has assembled a fine team of singers, all with highly contrasting voices, who spread the songs amongst them. Whilst the booklet includes a fine article by Francis Pott as well as an introduction from Iain Burnside, some details are tantalisingly absent. There is little in the way of dating for the songs, and no explanation of how the allocation to the different singers was allocated. For instance the six songs from Nine Songs after Goethe, Op.6 are sung Justina Gringyte, Nikolay Didenko, Robin Tritschler and Rodion Pogossov, is the change in voice types for variety, or are the songs written this way? But these are small niggles, this is a terrific set which introduces the undeservedly neglected songs of this fascinating composer. These are not easy songs to bring off, as Iain Burnside's booklet note makes clear, not just the technical complexities of the music but also the stylistic and structural idiom. 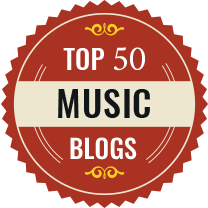 Burnside and his team make us forget any of this, and simply encourage us to listen to the songs in a series of vibrant and striking performances.